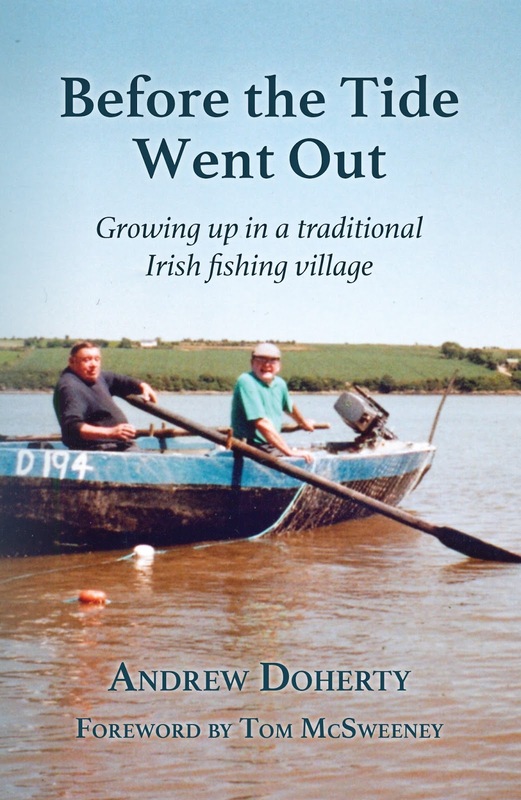 In my recent book I devoted a chapter to the pubs in the village and I distinctly remembered the McAlpin's arriving in 1971, Dunstan and Mary and family. They moved from Dublin to take over the pub from Kate 'Dips' Doherty, who was retiring. And they quickly became established by firstly providing salmon rolls and then moving to evening meals. In fact in a review some time back Tom Doorly described it as Ireland's first gastropub. Mac and Mrs Mac as they became known provided a lot of jobs in the village and gave a good price for large salmon too. Speaking of salmon, one knock on benefit, is that the salmon heads were deposited onto the strand and as nippers we had some of the best bait imaginable when we went crab fishing off the quay. I remember one evening when a very uppity gentleman parked outside with an alarm fitted on his car. All the youngsters of the village took turns to cycle past and touch the bonnet. Each time the alarm went off, the self important diner came running out...it never occurred to him to turn off the alarm, we had a night long entertainment, and he must have endured chronic indigestion. There was entertainment of other sorts though. The night Ronnie Whelan of Liverpool and Republic of Ireland fame was spotted inside and we gathered outside for autographs. Of course other soccer personalities were also there, Johnny Giles, Eamon Dunphy and Jim Beglin that I can recall. And there was the evening that one of the Golden Girls, actress Bea Arthur, strolled around the quay. We played cards on Sunday nights in the western corner. Thirties was the preferred game and we all wanted to be with the older players, where the craic was mighty but mistakes could be costly...at least to your ego. There were some characters too Martha Fortune loved her cards, her daughter Susan and her husband Paddy Duffin. Then there was Eddie 'Butty' Burke, Mossy O Keeffe and a carpenter from town Frankie Farrell. Frankie was a dry alcoholic who often brought a bottle of whiskey which he hid at his feet. While he sipped a mineral, he topped up peoples drink. His mission it appeared was to get everyone else drunk as he no longer could. 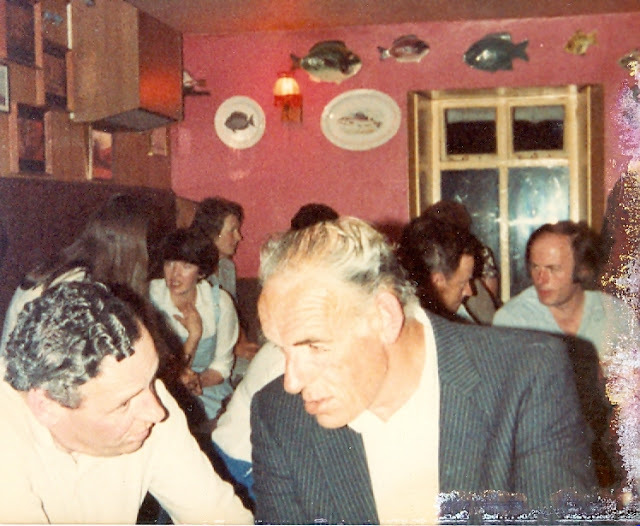 Of course there were earlier eras of music and craic, when families came from up and down river to events in the bar such as the Whitty's of Nuke, Phil Sherlock from Great Island and many more that I was too young to recall. Dylan Bible recently managed to retrieve the recordings off an old twin track recorded by his grand dad Tommy White with a musical evening in the bar featuring the Duffin family of the Rookery and Sonny Nugent who lived up the street and who was a great entertainer. 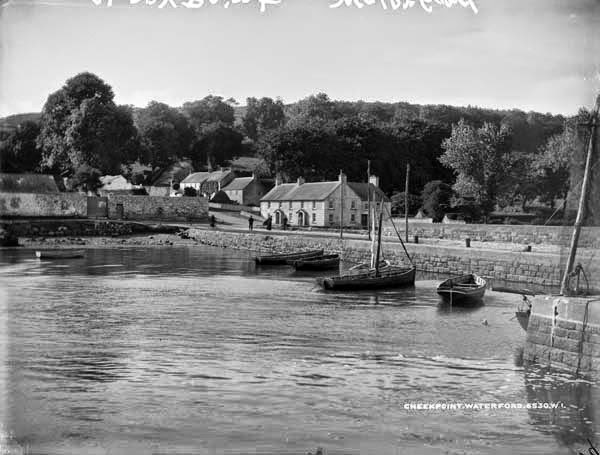 As regards the age of the pub or Inn, most believe it dates back to as early as the mail packets in the late 18th C which saw Cheekpoint develop as an industrial village. Knowing what we do of society at that time, its probably safe to assume there were many places to buy a drink. Certainly on of my fathers stories of the pub dates to that era. I've actually told it to camera thanks to Mark and Derek from Waterford's Epic Locations. But for those who prefer the written word, here's an edited narrative of my fathers tale. "There was a group of fishermen and others drinking at what is now McAlpins Suir Inn. Suddenly a cry went up in the village and while many turned to look, there was a man named Walsh with quick wits that turned on his heels and ran to the back door of the pub. As Walsh went through it, he heard the crashing and banging behind him as the Press gang rushed the pub's front door. He skipped over a ditch and ran. Approaching a house, he spotted an open window and dived through it, only to land into the lap of a sleeping lady. On awaking, her first impulse was to scream. At this stage the village was in uproar, some of the press gang crew going door to door seeking recruits and the villagers were meeting them with anything to hand. While Walsh pleaded with the lady to be quiet, her father heard her screams and burst in. Now he had been trying to marry his daughter off for some time, and he spotted his opportunity in an instant. He gave Walsh an ultimatum, the Press gang or the daughters hand. Thereafter Walsh, having had one too many in the pub could be heard to refrain from the bar counter, "should have went with the press gang"
I remember McAlpins on our Sunday spin and the salmon rolls when my gran and mother wanted to go home but my dad and grandad wanted another pint or two. There was a very tall man, seemed like 7 feet tall to us, used to come in and play the piano. It was settle in until we were asked to leave then. Do you know who the man might have been Andrew?